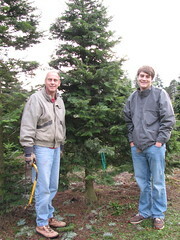 Every year we pack up what's left of the Bulthuis family and visit the local tree farm. Pickings are getting slimmer these days at the farm, but tradition cries louder than aesthetics, so it's off to Stock's for tree and candy cane. I was also able to get all the lights on the roof today. I was glad that the rain held off. Light and dry are both scarce commodities in the Puget Sound winter, so when you get both at the same time, you make hay.